The JUGS Lite-Flite® Machine delivers Big League style pitches at a minor league price.Learn to hit the breaking pitch without the fear of being hit! 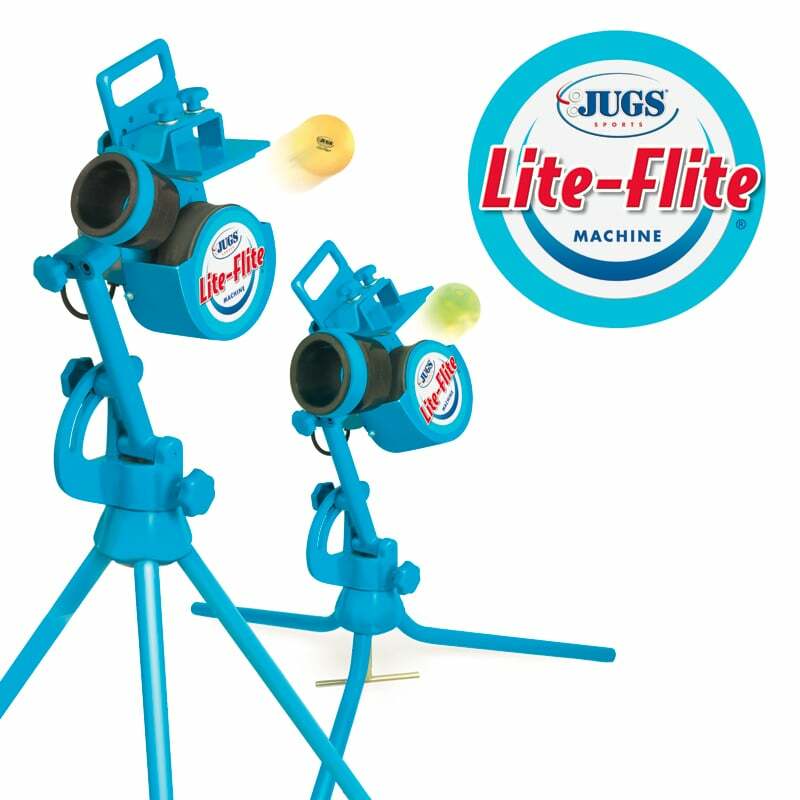 JUGS Lite-Flite® Machine throws: Left-Handed Curves, Left-Handed Sliders, Fastballs, Right-Handed Sliders and Right Handed Curves for both baseball and softball. Make practices more efficient with the JUGS Lite-Flite Baseball Feeder or the JUGS Lite-Flite Softball Feeder . NOTE: Feeders are all sold separately. Provides a whole range of movement to adjust for all types of pitches—including fastballs, curves and sliders. Simulates speeds up to 140 kph at 8 meters. Throws 11″ or 12″ Lite-Flite softballs, Lite-Flite baseballs, and the JUGS Bulldog polyballs. Because the JUGS Lite-Flite Machine only throws Lite-Flite balls and Bulldog polyballs, your hitters learn to hit the sharp-breaking pitch without fear of being hit by the ball. Quick-Change design features exclusive Switch-and-Play Knobs. Go from baseball to softball in a matter of seconds. Swivel-design base casting provides 360 degree movement for fly balls, pop-ups and ground balls.